Medicated Follower of Fashion: I'll show you my....bathroom! It's back.. do you remember my meme from earlier this year, "I'll show you mine..."? Well, at the request of the lovely Momoftwosalums, it's back! I do hope some of you reading will choose to join in. It's a simple meme, all you need is a camera and a little bit of time to write up a blog post. Then link up to the linky at the bottom of the page which will be open for a week. The idea behind "I'll show you mine.." is simple. I'm a nosy bugger and I love getting a glimps into other peoples lives. I make it fair though, I give you some incentive. I'll show you mine, if you show me yours! Ooooerrr!! I used to do the meme weekly, but I think as it's quite a labour intensive meme for all involved I'm going to do it twice a month and see how it goes from there. Right, let's get started. This week I'm showing you my bathroom, I hope you'll join in and show me yours! 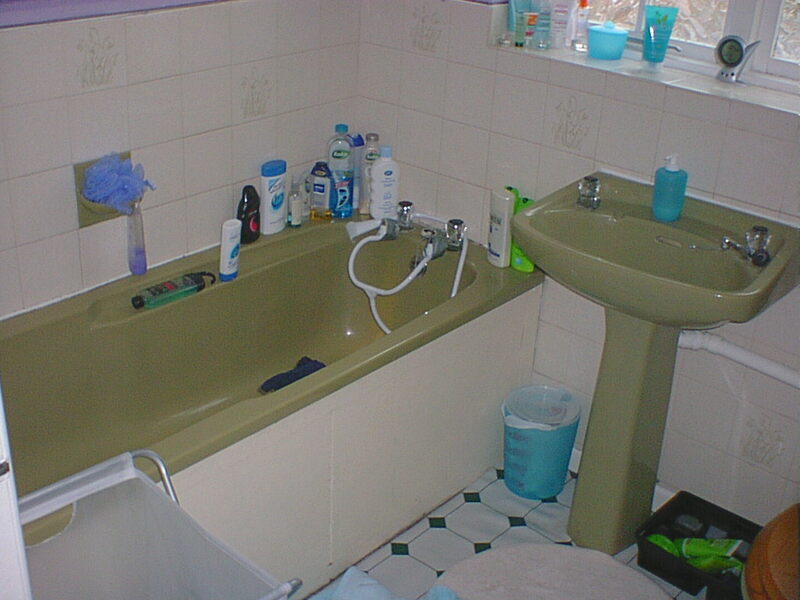 Our bathroom was MINGTASTIC when we bought our house in 2004. We lived with it for just over a year before having it ripped out and re-done in 2005. I cannot tell you how much of a difference it made to our lives. Our house was built in 1982 (my birth year!) 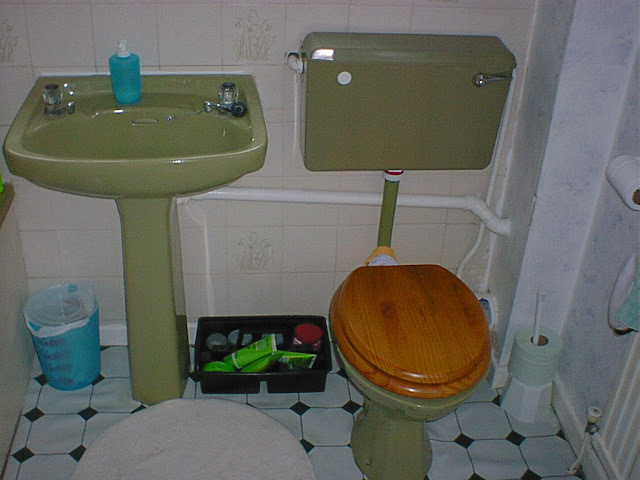 and it had the classic avocado '80s bathroom. There was no shower, so we used one of those cheap hideous and nigh on useless plastic attachment shower heads you can get for about a fiver. FOR A YEAR! Don't ask me what was going on with the walls.. Our house was rented before we bought it and there were all sorts of weird half-arsed "DIY" jobs all over it, half done wallpaper etc... it was bizzare. You can see how crappy the lino was, all wrinkled. It tore like a piece of paper. When we took it up we found newspaper from 1982 underneath! The loo was the best bit, it was so rusty that it constantly looked like we shat all over it and never cleaned up. Let me be clear. THIS WAS RUST, NOT POO! It also used to side around whenever you sat on it which was always fantastic when drunk. When you flushed it, the whole thing used to move. Reassuring. The bath was just grim, no matter how much I cleaned it, it always looked stained. It was just grim. We're quite proud of this - Pete did it himself using frosted sticky plastic. So nice to have a shower these days! I love our shower curtain. I wanted a periodic table one but it's SOOOO expensive. This is "20,000 leagues under the sea"
"BIG DUCK" was my Mum's but Ethan took such a liking to him he lives with us now. One of my most treasured photos, my Grandma, Mum & me as a baby. These towels were white, I dyed them recently, good old Dylon! We love wall stickers in our house. These robots were our first ones. So.. There we go!! That's my bathroom! 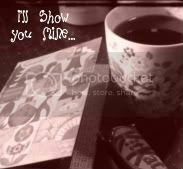 Want to show me yours? Follow the rules below! Thank you :) Duck rocks! My son likes to ride him around which is quite amusing!! Wow, what a transformation. Can't get over that green toilet!! And, love that new curtain and duckie. Cute! I know.. it was so gross!! Question... what do you use for people to enter your linky? And do you have to pay for it?? I am writing my post now! Ha! I was reading the first bit of your post and could see the picture of the avacado bathroom below - I read about how you'd redone it in 2005 and my brain was screaming, 'And THAT is how she's redone it???!'. LOL thats hysterical .... were you going to tell her if it was hideous :) ? ?